The gold coin pictures above are present on Romanian coins through the kind permission of VAuctions. 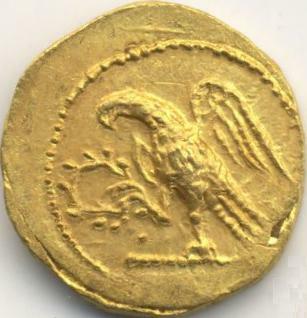 The coin is common, being considered a golden stater, commonly called Koson in Romania. The obverse of the coin is very resemblant to the reverse of the silver denarius struck by M. Iunius Brutus in 54 BC (on its obverse being Libertas - divine abstraction of freedom). 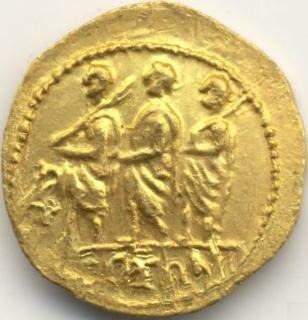 Consul L. I. Brutus is displayed on the reverse of the forementioned denarius, framed by two lictors and preceded by an aaccensus (magistrate attendant). The reverse is very similar to that of the denarius of Pomponius Rufus (struck in 73 BC). The two forementioned pieces can be seen on Wildwinds, the denarius of Brutus on Browsing Roman Republic Coins of the family Junia page, and the denarius of Q. Pomponius Rufus on Ref Pomponia 23 denarius page. Monograph Monede şi bancnote româneşti (1977) presents two hypotheses on the mysterious Koson origin. The first hypothesis (Mommsen) - most largely spread on the net - considers the Kosons as gold monetized by Marcus Iunius Brutus and destined for the payment of Dacian mercenaries hired in his army. The coin displays the name of the Dacian king Cotiso - Koson, that allowed his subjects to serve for money inside the Roman army. Brutus, convinced that Julius Caesar restrained liberty, led the conspiracy of March's ides (15th) in 44 BC. Once the second triumvirate was drawn up (Marcus Antonius, Lepidus and future emperor Octavianus), the persecution of republicans started as well as the persecution of Caesar's murderers. Aftermath of the Philippi battle (today Krenides, in Greece), the republican side was defeated and M. Iunius Brutus commited suicide. Brutus became for Romans a symbol of liberty and example of civil virtues. If this second hypothesis is right, then the Kosons were struck around 44 - 42 BC (between March's ides 44 and the Philippi battle in 42). This opinion appears at Nicolae Iorga (History of Romanians, Rome's Seal), citing Th. Mommsen and Vasile Pârvan. It must be said that Odrisi Thracians (that have lived in the middle of the nowadays Bulgaria) had several kings named Kotys. Sadala II, Odrisian king, died in 44 BC leaving his country as heritage to the Roman Republic. A hypothesis was emitted that his treasury was used to strike the Koson gold coins. The second hypothesis is more direct, assuming the coins were struck in Dacia, by king Cotiso himself, the name of which passed to the coins in one of its versions. At the '70s level of knowledge, monograph Monede şi bancnote româneşti alone mentioned the following places of Koson discoveries: Grădiştea Muncelului, Sarmizegetusa, Guşteriţa - Haţeg, Orăştie, Vîrtoape, all former in the county of Huneodara, Axente Sever and Nochrich in the county of Sibiu, the municipium of Craiova, Brezoi on the Olt Valley, Cozma in the county of Mureş, the municipium of Timişoara and Vizejdia in the county of Timiş, and Vîrşeţ in the Serbian part of Banat. We join our opinion to the second hypothesis. An inferior technical level of these mint products (mostly discovered in Dacia) points to the native Dacian mintage, a mintage that in the vast majority of cases was satisfied to imitate coins of large circulation of other emitters (to a certain degree in a rather rudimentary manner, its products easily distinguishing themselves from the originals struck by Philip II, Alexander Macedon and Philip III Arrhidaeus). As seen in a confrontation with the originals, the Koson does not only imitate, it also simplifies its Roman patterns. Moreover, Roman mintage was always characterised by diversity and originality, new events bringing up new designs best fitted to spread knowledge on a particular emitter and his achievements. It is possible that king Koson be one of the conspirators against king Burebista that overthroned the later and shared his vast kingdom. After 1990 the press gave vent to many legends about Kosons, stolen from Dacian fortresses, from Sarmizegetusa especially. The press wrote even about bronze and silver Kosons, in fact simple Roman coins. The gold coin pictures above are present on Romanian coins through the kind permission of Mr. Clark Smith, numismatist and renowned specialist in world gold coins. The National Bank of Romania issued in 2005 a replica of the koson, in a mintage of only 250 (two hundred and fifty) pieces, bearing as distinctive sign an R inside the wreath held by the angle in its claws. The replica has 20 millimeters in diameter, 8.5 grams and the title of 99.9% gold. Given the small mintage, the replica is far scarcer than the original. The replica of koson gold coin belongs to the History of coin series. To the same series belong two other replicas, one of 20 lei 1868 gold coin and one of a gold coin-medal issued by Constantin Brâncoveanu in 1713. The koson replica can be seen here.